I often get my steak cut from supermarkets when they are on sale and it's really fast to cook them to go along with either salads, mash, pasta and many other sides. Furthermore, if you have a mini gathering, have a few steaks on hand and prepare in different styles to impress your guest! I personally prefer rib eye to sirloin as the marbling and texture are better. There are many other different kinds of cut as well, but i will only focus on the widely used cut which is rib eye and sirloin. That secret combination garlic-butter-thyme is the key to how well your meat will taste even if the cut you get is not of very fine quality. You can use this combination on Bratwurst or Italian Sausages and surprisingly it works really well. I will be sharing with you guys this easy recipe with the combination for steak matched with slow roasted garlic. 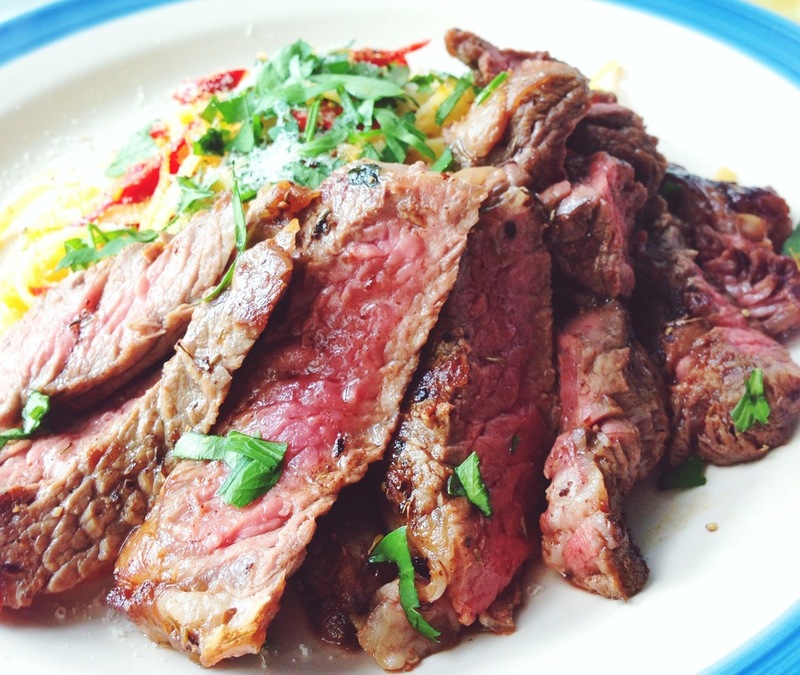 Of course you can choose to pre marinate your steak beforehand using other recipes. But I hope this post does provide some insights and other tips in preparing your steak. Prepare slow roasted garlic by putting 4-6 cloves of whole peeled garlic in a small pot with olive oil in till it barely cover the cloves. Turn to the lowest heat possible and start cooking till it turns soft yellowish brown. About 20-30mins. Season the steak well on both side with salt and pepper. It should always be left to room temperature right before you cook so that it won't affect the doneness of the meat. Heat pan with olive oil and make sure it is smoking hot enough before you put the steak in. Once the heat is up, lay in your steak. It should be sizzling away. Check the underside and make sure its seared till nice brown, then turn to the other side and start basting again. Depending on how well done you want your steak to be, test the meat by using the finger-thumb method as shown above. If your steak is really thick and you are doing medium to well done, throw in the oven for 5-10 minutes after both sides of your steak are seared brown. Once your steak is done, let rest for 5-10 minutes, this step is very crucial. It helps to seal the steak juices in. Drizzle some balsamic vinegar on it and matched with slow roasted garlic. 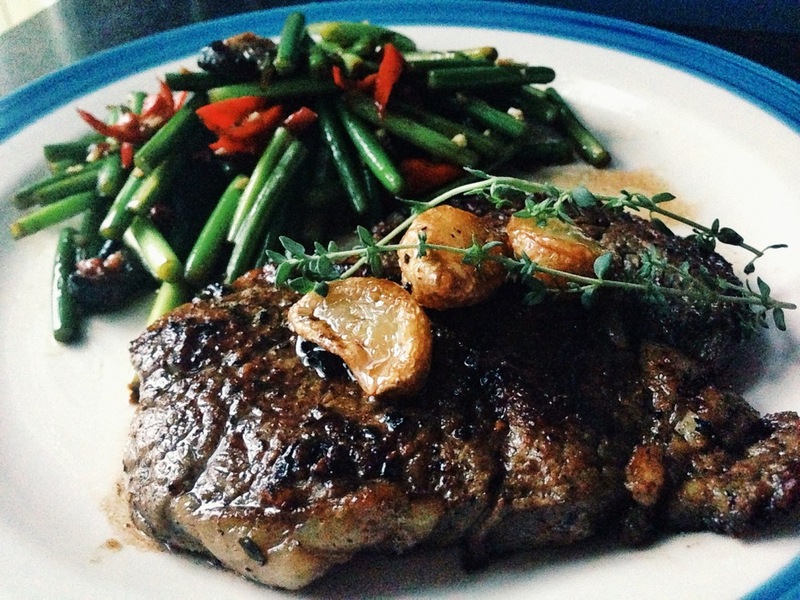 This recipe keeps you wanting more as the garlic balances out the meatiness of the steak. Enjoy!!! If you have any questions or queries feel free to comment below!